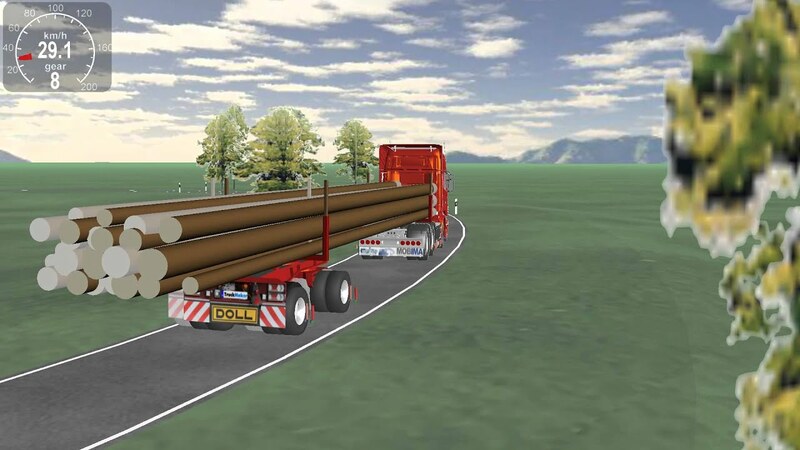 An innovative steering system in long timber transport, the positive-steered self-steering trailer DOLL ratioplus unites the time-tested characteristics of DOLL self-steering trailers with the track-in-track benefits of positive steering models. The ratioplus steering system was developed based on the time-tested RATIO self-steering trailer and brings greater user convenience, improved safety, more efficiency and greater driving pleasure for long timber hauliers. In the forced steering mode, a self-steering trailer's steering axle responds instantly and directly to the truck bolster's steering angle, whether driving forwards or reversing. The directional stability generated by this process offers immense advantages in steering performance around tight bends and during off-road use while also increasing steering speed. The advantages of a self-steering trailer over a positive-steering model – low tare weight, low wear and greater efficiency – remain intact. It is extremely easy to switch between positive-steering and self-steering mode as required – simply push a button. Since the handling advantages of a self-steering trailer are particularly evident at higher speeds, the system automatically switches to self-steering mode at a speed of 35 km/h or higher. DOLL ratioplus vehicles are equipped with automatic track adjustment as standard. Vehicles also feature optimised hydraulics and hydraulic bolster block. The positively-steered handling in "track-in-track" mode ensures that the self-steering trailer follows the same course as the truck. Easier to handle the vehicle in tight or blind curves, while reversing or when manoeuvring in highly confined spaces. The new steering system responds more directly and far more rapidly and is thus easier and more comfortable for the driver to operate. Manual steering is still possible, but only required in extreme situations. The self-steering trailer is safely prevented from swerving, meaning greater safety for both the driver and vehicle. The time-tested RATIO steering system and supplementary steering are available at all times.